It was a sunny Saturday afternoon just right for the launching of the annual HONfest, in Hampden. Even at “The Avenue,” 36th Street, was packing up quickly with festival goers, many wearing their ubiquitous beehive hairdos. Oh, so Bawlmerish! This is the 23rd rendition of the popular event. Its purpose, according to the program notes, is to celebrate the “working women” of our fair city and their continuing contribution to its viability. I second that Motion. The term “Hon” is one of endearment. I can personally vouch for that going back to my salad days as a Locust Point dude, who liked to also hang out in Highlandtown (Hon); and Up the Hill, on Webster Street at Fort Avenue. 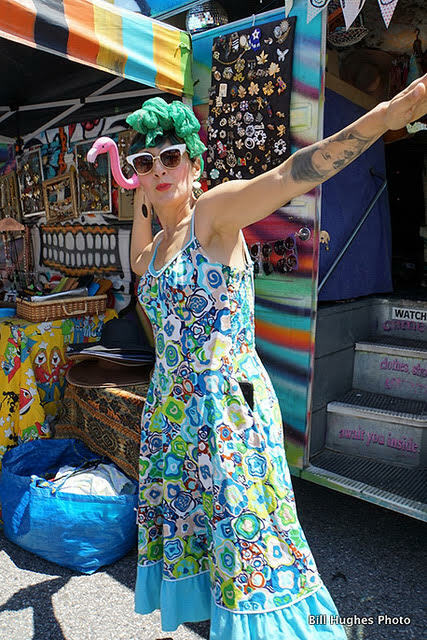 Bring your dancing shoes to HONfest. There are three stages blasting out music of all descriptions, (& sound levels). Thirty-six live artists will be performing today and tomorrow right up till closing time. HONfest will be open on Sunday from noon to 6 pm. Check out the schedule for show times, especially for its main stage, which is located in front of the Bank of America. Check out HONfest schedule. Check out some of Hampden’s working class origins. It was a mill town originally, along with its sister neighborhood – Woodberry. There were plenty of vendors on hand selling their wares today. I think more than last year. And if you get hungry, don’t worry, there are plenty of food vendors, hawking drinks, too, and sure to suit every taste. As soon as I landed, I headed for the Art Under Ground Studio, to see if owner Rick Santiago, had any specials for sale. Indeed, he did. One of my fave artists, Paul Mintz was out front of Rick’s store drawing portraits for customers and selling some of his art. He did my portrait last year. So, I had Mr. Mintz draw one of my grandson, Matteo, age nine. He’s visiting from LA. Indeed, it was a splendid job Mr. Mintz did on it. Further down “The Avenue,” I had a chance to chat with another pretty darn good artist, Matt Muirhead, who is also a popular Hampden resident. More of my photos can be found on Facebook.